Each year Peoria, Illinois, has a really awesome Parade of Lights with animated floats covered with strings of Christmas lights. 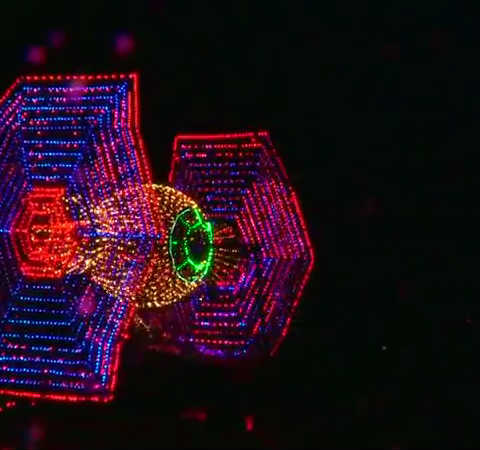 Puff the Magic dragon, swimming ducks, and a TIE fighter all constructed from metal frames covered with twinkling LED lights. Wait…TIE fighters? Why yes. Oh, and there goes the Enterprise. And the Batmobile. And a flying purple people eater. 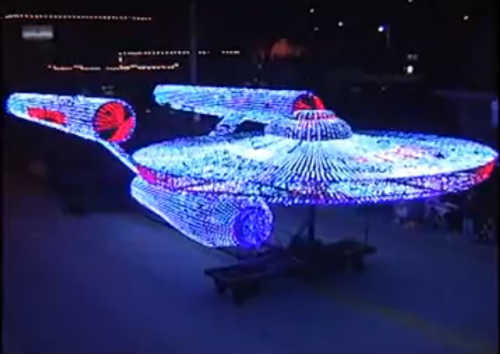 The holiday event is more about fun than recycling the hackneyed stock-in-trade of the typical Christmas parade and Peoria’s geek community is clearly alive and well. 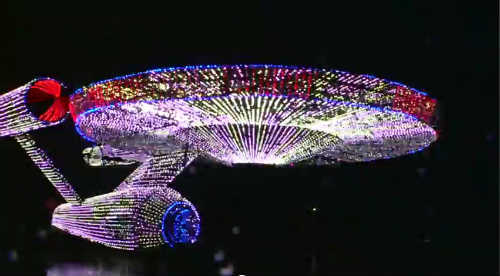 The 2011 Parade of Lights itself took place November 26 but it’s not too late to behold for yourself the glories of the starship Enterprise constructed entirely of Christmas lights. (they’ve playfully written “USS Peoria” on one of the warp nacelles.) All of the brightly lit floats are available for viewing from December 2-31 at what the city of Peoria, Illinois, calls Folepi’s Winter Wonderland. For $10 you can drive the nearly 2-mile stretch where all the Parade’s floats are parked and view them at your leisure. 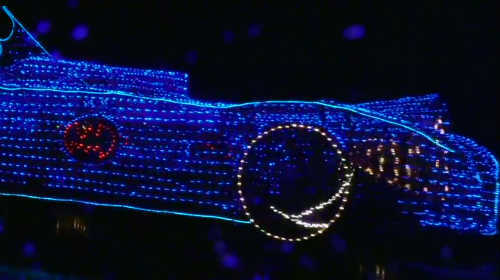 I was able to take screen shots of some of the fan-tastic floats from the 2011 Peoria Parade of Lights. These are from news coverage and their promotional video, so they’re not so sharp. Sorry ’bout that, but Peoria is kind of far from San Diego – stupid geography, always thwarting me. There’s also an A-wing in the parade, but I couldn’t get a good enough screen shot of it.